On arrival at Tromsø airport take the airport shuttle transfer to the Clarion Collection Hotel With. Check in and enjoy a light evening buffet supper (served until 9pm). If time permits you may wish to join one of our Northern Lights searches this evening. Today is at your leisure. Choose from a wide range of excursions, or explore the town we would highly recommend a trip up Fjellheisen which is a cable car jouney offering panoramic view over Tromsø. Please contact us for a full list of optional safari excursions. After a leisurely breakfast, a private transfer will take you on the 2¾ hour journey through the Arctic wilderness, arriving at Lyngen Lodge in time for afternoon tea. Settle into your surroundings, then marvel at the changing colours of the Arctic sky and watch for the Northern Lights. Evening meal served at the Lodge. 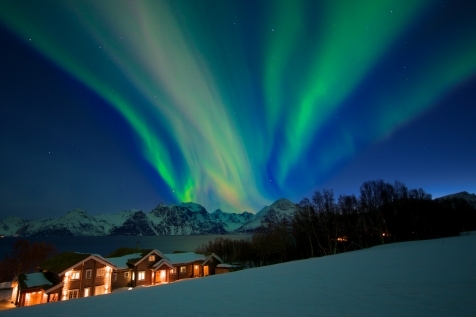 Lyngen Lodge offers free lectures on the origins of the aurora and additional photography lessons are available (on request and at a supplement) to enable you to capture this natural phenomenon. Please enquire at time of booking. At leisure. 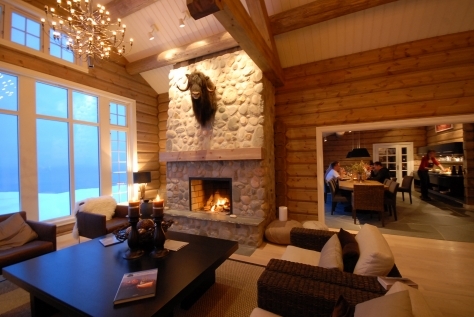 Lyngen Lodge is the perfect place to relax, unwind and rejuvenate your soul. Do not under estimate the value of doing nothing, then resting afterwards. Alternatively combine your stay with one of the Arctic adventures on offer. After breakfast you will be transferred back to Tromsø in time for your flight home. Lyngen Lodge is the brainchild of Graham Austick, whose vision was to create a tranquil haven without the need to compromise on quality or comforts. It was when out skiing in the Lyngen Alps that he stumbled on the ideal setting and the project took hold. 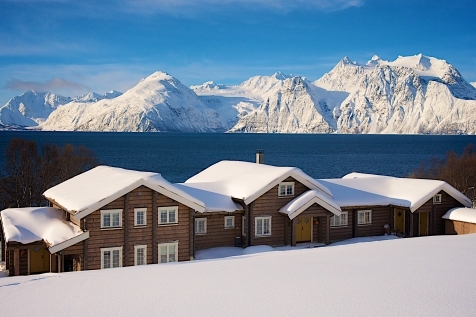 Lyngen Lodge now provides a sanctuary for up to 18 people accommodated in 8 en-suite fjord-facing rooms. Large panoramic windows frame commanding views over the Lyngen Alps, whereas the soft pastel colours of the interior complement the natural surroundings. The large open stone fireplace contributes to the warm and welcoming ambience. Guests are catered for on a full board basis. Delicious menus reflect Norwegian coastal culture and are prepared from the finest local produce. Additional amenities include a fully licensed bar, dining room, lounge, library, sauna and outdoor Jacuzzi and the services of the lodge manager. Take a guided Snow Shoe tour into the wilderness straight from the Lodge. This is a great wait to explore the surrounding landscape and witness stunning views across the entire Lyngen Peninsula national park. This tour also gives you the opportunity to see rare animal tracks including moose, lynx and the wolverine. After a scenic 30 minute drive you reach the Reisa Valley where your dog sledding journey begins. Following expert tuition you mush your own team of dogs into the wilderness following a trail that winds through open valleys and snowy landscapes. Stop half way for a wilderness lunch cooked over an open fire before you return back to the starting point ready for your return transfer back to the lodge. 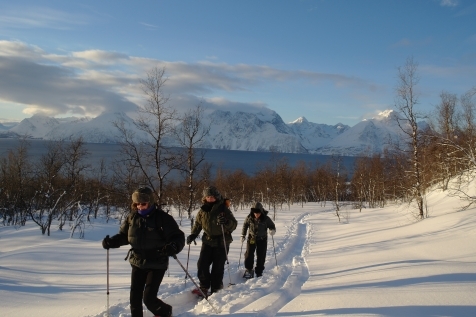 Board the ‘Spirit of Lyngen’ for a cultural and wildlife adventure. The Journey along the fjord begins with some dolphin spotting along the nature reserve at Spåkenes before heading to the island of Uløya. You will then venture east to the Lyngen Alps where you visit the ice cave and the sheer towering rock walls that plunge into the ocean. Europe’s largest eagle the Havn Ørn is often regularly spotted at this location. 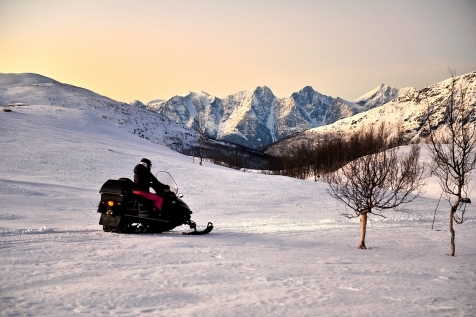 Be a passenger on a snowmobile into the high mountain terrain. Once on the mountain plateau you will experience ice fishing on the frozen lakes for mountain trout and take in the spectacular views over the Lyngen Alps. Master the art of cross country skiing on the tracks that are home to the National Norwegian Team. The tracks are just a short 15 minute drive from the lodge where your guide will teach you the basic skills you need before you head off into the snow covered forest.